Past and present Sports Illustrated staffers offer their personal memories of the late, great Muhammad Ali. 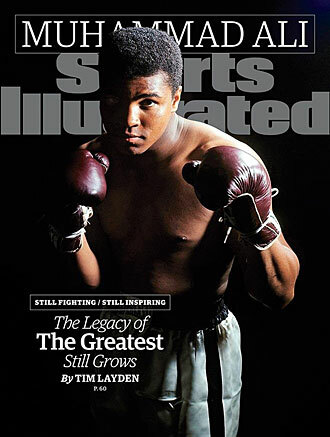 No athlete was more synonymous with SPORTS ILLUSTRATED during the magazine's first 30 years than Muhammad Ali, who rose to prominence around the same time SI did. 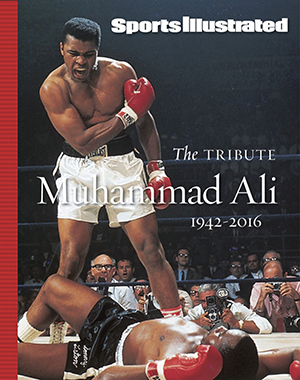 Ali died last week in Phoenix at age 74 and landed on the cover of the magazine for the 40th time. From his days as a teenage Olympian through his unforgettable boxing career, his battles over Vietnam and religion, and his fight with Parkinson's disease, Ali's life and times have been chronicled by dozens of SI staffers through the years. Several of those people got to see Ali in private moments that they have never forgotten, and they were asked to share those personal memories of the fighter universally regarded as The Greatest. Below are recollections from writers Gary Smith, Frank Deford, Rick Reilly, Steve Rushin, Tim Layden and Franz Lidz; boxing editor Richard O'Brien; and photographers John Iacono and Manny Millan. For more about Ali, check out all of SI.com's coverage here, and browse through more than a half-century of Ali coverage in the SI Vault by clicking here. I’ve followed Michael Jordan in Paris, Tiger Woods around St. Andrews and the President of the United States through the West Wing of the White House and none of them caused anything like the tumult that Muhammad Ali did walking into the men’s room at Chicago's O’Hare Airport 20 years ago. The sense of disbelief occasioned by his sudden appearance, in human form, in the most humbling of all human settings, was a shock to bladder-taxed travelers like me, as if he had just fallen out of the sky. Which of course he had just done. Surrounded by well-wishers, Ali was all stillness at the center of a happy hurricane. He reminded me of a man calmly walking in a swarm of bees, one half of his favorite simile. A quarter century removed from his fighting prime, everyone addressed him as Champ, a lifelong honorific like Doctor or Coach or Mr. President. He kept moving. This was his life. I saw the very same scene, again by chance, repeat itself on West 50th Street in Manhattan—Ali walking through Rockefeller Center, people trailing like a bridal train. I joined his entourage of giddy strangers for a block, helpless to resist. When I heard Ali had died, I put on “Zanzibar,” Billy Joel singing about the Champ in late career: “Ali dances and the audience applauds, though he’s bathed in sweat he hasn’t lost his style.” The second verse is about baseball—“Rose he knows he’s such a credit to the game”—and hasn’t quite held up. But for nearly 30 years, deep into Parkinson’s, dancing days long over, Ali’s style never wavered, his charisma remained intact. Muhammad Ali and the symbol on that men’s room door at O’Hare were the rarest of things: Icons beyond language, globally recognized, ever a welcome sight. In December 1966 I was a 25-year-old working for LIFE magazine and helping Neil Leifer, a childhood friend, for an SI photo shoot at the LIFE photo studio on 54th Street in Manhattan. Neil asked me to take a picture of him and Ali together. I said sure, and did so. Then I said, "How about me?" So right before Neil took the picture of Ali and I, Ali raised his hand over his head and looks at me and goes, "Boy, if I ever hit you you’ll wish you wee in Vietnam with a BB gun." I said, "Champ, if I ever hit you by the time you get up your clothes will be out of style." He started laughing and said, "I like that one, I'm gonna keep it." When he left I went in the dressing room where he changed to make sure he didn't leave anything behind. On the table was this big diamond ring. I said, "Oh my god he left his ring here." He calls and says, "I left my ring up there." I said, "Oh was that yours? I sold it." He sent one of his guys up to pick it up. Not long after I became an SI photographer. In about 1983, I was with my wife, Nancy, my daughter, Alexis, and her friend Claudine, in Atlantic City where I was getting ready to photograph a fight. The night before the fight there was a knock on my hotel room door. It was Ali's wife at the time, Veronica. She says, "I see your daughter has been running up and down the hall. Ali loves children. Do you mind if he says hello?" I said of course not, so Alexis and I went over to his room, and I took a picture of her sitting on his lap. There was only one lamp on and it was very eerie lighting. I said, "How you doing, Champ?" He says, "Did you call me chump?" Afterward my daughter asked, "What happened to him?" I said he was very sick. This was right before he was diagnosed with Parkinson’s. You could see it in his face, and he had been stuttering. It was sad to see. But for that night at least he was still a joy to be around. I always loved his sense of humor. The first time I met him I was a young reporter at SI, I believe in the summer of 1962, when he was sent up to Albany by the boxing people; there was a bill in the New York legislature to ban boxing. That was before Ali was the brash mouth that he became, and he was thought of as a very attractive young man and so he was sent to speak to the legislature and I went up with him and rode back with him. I met him when he was very young. I wasn’t smart enough to figure it out, but he was already starting to go through some kind of a spiritual upheaval at that time. He wrote out all kinds of things on the train that I should have saved because they would probably be very valuable now—and I didn’t understand any of it, stars and moons and things—but he obviously was stating to think about his religion, Christianity, and I think that was the first move into him joining Islam. Say "sports art" and you think of the theatrical exploding pizzas of LeRoy Neiman. Thirty-one years ago I was on assignment with the painter in Los Angeles when he suddenly said, "Let's drop in on Muhammad Ali." Rather than slather him in pepperoni and tomato sauce, Neiman wanted to sketch him en plein air. Ali was the one transcendent athlete in Neiman's pantheon. 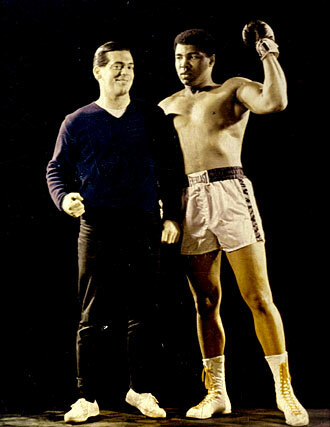 Indeed, the artist said, it was Ali who first sparked his more intimate involvement with athletes as people. He'd met the boxer in 1962, and had painted him dozens of times. 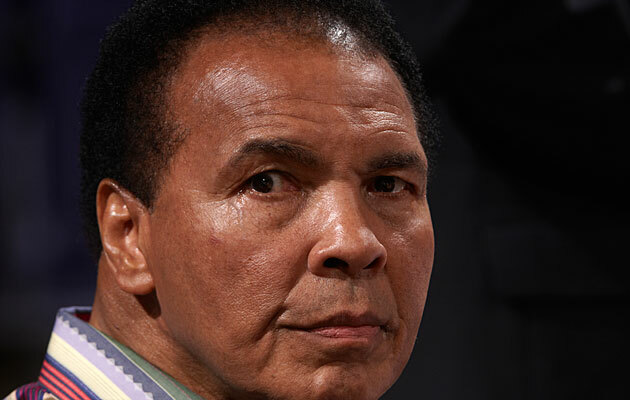 "Ali's the one athlete who looked the same his entire career," Neiman said. Neiman told me he was proudest of a life-size painting he made after the second Liston fight—Ali standing triumphant in the ring, arms upraised. Ali's then estranged wife, Veronica, had loaned it to a museum and the boxer had not seen it since. We visited Ali at his home, a well-guarded, 22-room Victorian mansion in Wilshire. The place was almost completely empty. Ali was taking down his chandeliers and packing up his clothes. Veronica had recently moved out. Ali said he was going to get a mobile home and spread the word of Islam. "You're my hero," said Neiman, meaning it. "I'm just a washed-up bum," said Ali. He moved ponderously toward a bookcase and took down a Bible, opened it and made Neiman read the Second Commandment: "Thou shalt not make unto thee any graven image, or any likeness of anything." Ali said nothing for a moment. He was busy laying out two dozen pictures of Jesus on the carpeted floor. "Imagine you're white, and you see a black Jesus and black angels all your life," he said. "It'd mess up your mind." Neiman asked, "Are you saying Jesus was black?" "No doubt about it," Ali said. "Jesus was a black African. That's the way it was written in the earliest scriptures. But centuries ago, the words got changed. The white priests, the white bishops, the white cardinals, the white popes couldn't live with a black messiah. So Jesus turned white." "Jesus was a black man?" asked Neiman. He looked slightly uncomfortable. Ali frowned and grabbed one of the pictures off the floor. "Here's proof," he said. He handed Neiman a glossy photograph of a black man with a battered and chipped face as noble as an ancient Benin sculpture. "No, Jesus Christ!" said Ali. We stood in awkward silence, which I awkwardly rushed to relieve: "That's cool," I piped up. "I wonder what kind of cameras they had in those days." The Greatest looked at me and smiled. The photo to the left comes from a photo shoot in 1970 at the 5th Street gym in Miami, where Ali was training. During the photo session, I asked Ali if it would be OK to spray his face with water to make him look like he was perspiring profusely after a workout. Ali's reply was that as long as it made him look "pretty", I could spray as much as I pleased. As this week's cover picture of Ali, taken that day, shows, Ali never looked prettier! The 30 pictures in Al's old barn are what Muhammad wants me to see. None have been hung. They’re on the floor, leaning against the four walls, pictures and paintings of Ali in glorious moments surrounded by kings and presidents, champions and celebrities—all looking up at him. A pair of pigeons flap up in a rafter as we enter. He pauses, peers closer and begins to notice, in picture after picture, the bird crap splattered across his image. It’s 1988, seven years after his retirement, four years after he’s been diagnosed with Parkinson’s syndrome. Ever so slowly, without a trace of irritation or impatience, without a single word, head shake or disapproving glance toward the rafters, he walks around the barn, turning his face and dung-streaked moments 30 times to the wall. When I was at his house for the "Ali and His Entourage" story, at the end of lunch I went to the bathroom and when I tried to come out the door wouldn’t open. I thought, “Oh crap, how did I do this, what the hell am I supposed to do here?” Finally I’ve just about given up and I hear this crazy little giggle on the other side of the door. Ali the whole time had been holding the door closed on me. Late last summer, SI executive editor Steve Cannella assigned me the story on Muhammad Ali that would accompany SI's creation of the Muhammad Ali Legacy Award. The process of reporting the story would be unusual: Ali was still capable of speaking, but only sporadically and not on demand. A conventional interview was out of the question. Ali's wife, Lonnie, put me in contact with several people who had been close to Ali but who had seldom been interviewed or shared their recollections. She encouraged me to send questions via email, which she would have Muhammad answer on one of his good days. Most importantly, she allowed me behind the curtain at a private function where Ali was photographed with visitors. That scene was intensely emotional and bittersweet and formed the opening paragraphs of my story. What happened in the months following the story surprised me. 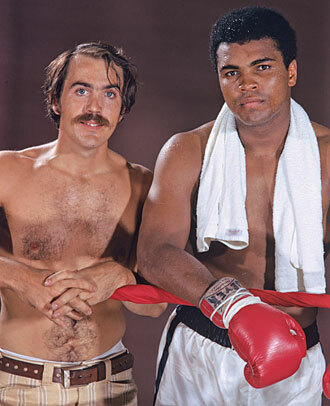 I received numerous emails from people who hoped to reach Ali -- Muhammad or Lonnie -- through me. I made a decision not to forward the letters, because I didn't feel it was appropriate to put people in Lonnie Ali's inbox, simply became she had helped me write a poignant story about her very famous husband. I could only imagine the many ways in which people try to reach her and Muhammad and I chose not to add to that volume. It seemed like as betrayal of their trust and confidence. It was remarkable to hear that one forgettable opponent's life had been so changed by the experience of getting punched into submission by a fading, disinterested Ali. But so it was. I saved the email, thinking that perhaps I would eventually see Lonnie again somewhere, sometime and mention it to her. That did not happen and now Muhammad is gone nabbed Jean-Pierre Coopman -- U.S. writers nicknamed him ``The Lion of Flanders,'' though he never called himself that, nor did any of his Belgian fans -- will never get his final meeting. I feel badly about all of this and I hope that Coopman is at peace with his memories of The Champ, more resonant than most, having felt his fists and tasted his sweat. And I wonder how many others there are who carry a moment with Ali, and hold it close. In San Diego in 1992, a few days before Terry Norris, then the WBC super welterweight champion, was to face Carl Daniels, the promoters had brought Ali in for some pre-fight hoopla; it may have had to do with his 50th birthday. A suite was set aside in the official hotel and those of us in the boxing press were invited to a meet-and-greet. We all milled around waiting, making small talk about Norris and other upcoming bouts. And then suddenly Ali was there. He strode into the room amid a swarm of handlers and p.r. types. Jostled a bit, I moved aside and found myself squeezed between the wall and the back of a sofa—just as Ali sat down on that sofa directly in front of me. Immediately, a wall of photographers, 20 or more in that cramped suite, assembled in front of him. They were kneeling and crouching and standing on tip toe no more than four feet from his face, their cameras clicking, flashes going off. I was right behind Ali’s head and, right then, blinking, I realized that this was what the world looked like to him every day, what it had been like for more than 30 years. It was just a glimpse, but it was overwhelming.